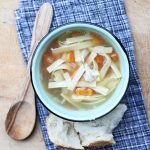 My family is a big fan of old school comfort food, and you can’t get much more old school than chicken noodle soup. But let’s be honest, it’s not the fastest thing in the world to make from scratch. So, like most things in life, I had to figure out how to make it fast – oh and I wanted it to taste like the old fashioned stuff. Normally I don’t share such basic recipes, but my daughter has recently moved out and asked me to write this (plus another coming soon) for her. And since I started this blog originally as a scrapbook for my children – this post is for her. In the bottom of a heavy bottom pan (like a dutch oven) on medium high heat, use the olive oil to sauté the onions and celery until translucent. Add in the chicken stock, diced chicken breast, carrots, salt, pepper and sage. Once the broth is boiling, then add in the pasta pieces and cook three minutes. Serves 6 people. In the bottom of a heavy bottom pan (like a dutch oven) on medium high heat, use the olive oil to sauté the onions and celery until translucent. Add in the chicken stock, diced chicken breast, carrots, salt, pepper and sage. It’s so super fast that it’s the perfect meal on those cold, blustery days. 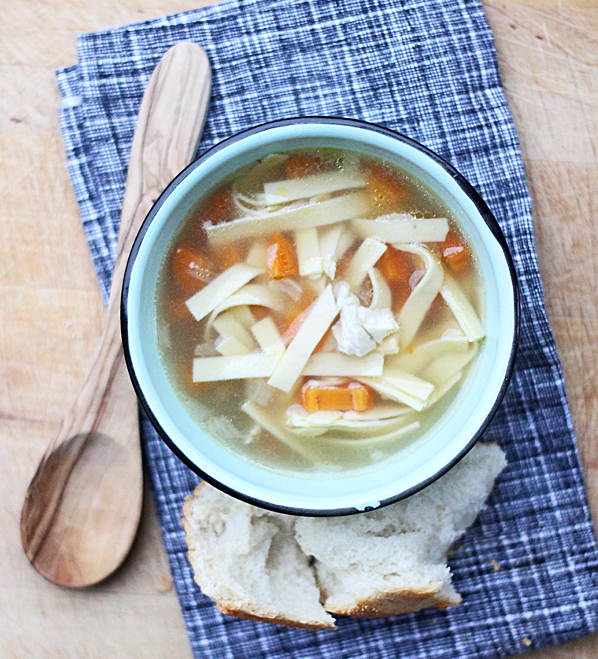 Just stop by the grocery store, pick up the ingredients (plus some good bread) and you’ll have Chicken Noodle Soup on the table in no time flat. Much easier than making it 100% from scratch and it’s seriously good! 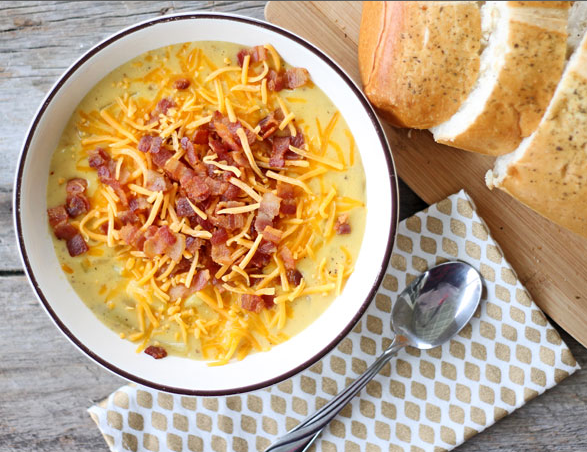 If you like this recipe, you might also like my 20 minute Bacon Cheddar Potato Soup. I make chicken soup from a rotisserie chicken too. Kroger has an onion/celery/carrot blend in the frozen veg section, so I don’t even have to open multiple cans or chop any veggies! 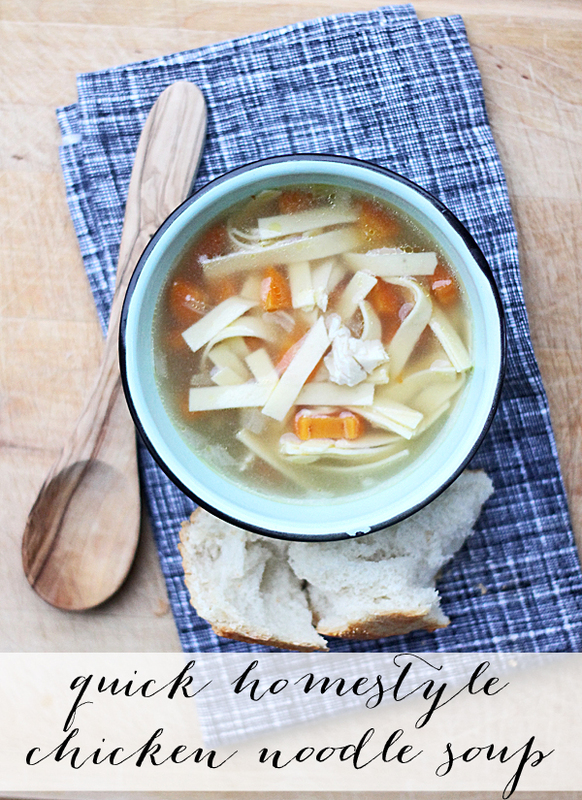 Good morning Gina … I enjoy you’re site so very much … i am going to be making your chicken noodle soup recipe tonight when i get home, thank you for sharing your quick homestyle recipes, (for us “non cookers”) they are a treat to follow.